The cold, cloudless evenings in the fall, winter and spring may be hazardous to the health of your plants and flowers! During the day, your plants and the soil absorb and store heat from the sun. As the day turns into night, your plants quickly begin to lose all of their stored heat. Clouds will help to insulate and slow the loss of the heat, but a cloudless, wind free night will afford no protection whatsoever. The temperature within the soil and in the plant's cells may even drop to a few degrees colder than the air. As the temperature drops, the moisture in the air condenses into dew, which then freezes when the temperature reaches 32° F. on the plant surfaces. At 32°, damage to most plants may be minimal, and only affect a leaf or two. However, if the temperature drops far enough for the plant cells to freeze, non hardy plants will die. Weather conditions can bring about a frost, even in supposedly frost free areas. It is important to heed the warning when your local forecaster announces 'a chance of frost', and take precautions to protect your garden. Often times it is possible to extend your growing season by several weeks if you are able to keep your plants alive through a single early frost! The best way to avoid frost damage to your plants is to grow plants that can withstand the frost. The term 'frost hardy' is often misleading because of the degrees of frost (i.e. light frost vs. hard killing frost). It is a good idea to ask a qualified local nurseryman what is suitable to grow in your area. Even better, look around your own neighborhood, and see what survives and thrives in other local gardens. Often times a plant will survive frost on the foliage, but the same frost would kill any flower buds which have emerged so in areas where late spring frosts may occur, you should choose varieties of plants that bloom later.. Cold air, being denser than warm air sinks, so low lying areas of your garden can be several degrees colder than other, higher spots. 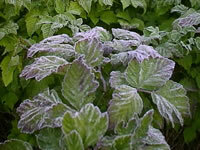 Consequently frost may occur in these areas when there is no frost evident anywhere else in the garden. Plant your more tender plant species on higher ground or on slopes where the cold air will flow past the plants as it moves to the low point. Any sloping area is far less prone to frost, because the cold air can't settle there as easily. Precondition your plants to withstand cold temperatures by discontinuing fertilizing in early September, so that no new foliage is on the plant when the cold temperatures arrive. Older leaves are much tougher and more capable of surviving a frost. 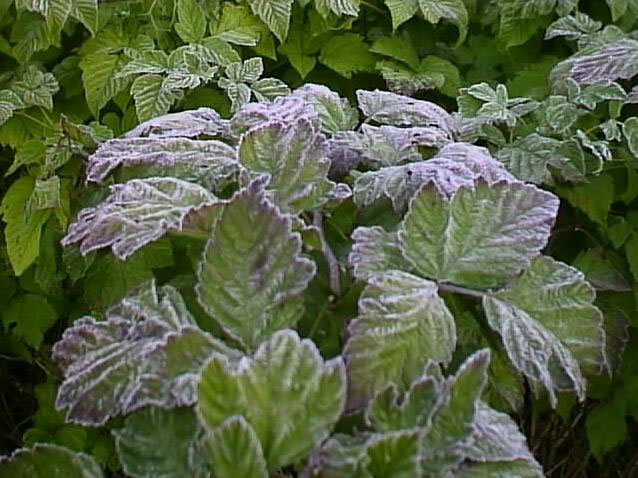 When the inevitable occurs and a frost is expected, there are several things which you should do to protect your plants. Water the garden thoroughly before nightfall. The soil will release moisture into the air around your plants during the night, keeping the air somewhat warmer. Even a slight breeze will prevent cold air from settling near the ground during the night. You can help keep frost from forming by providing this breeze artificially with an electric fan. Be sure to protect the fan and all electrical connections from water and the elements. Cover up before dusk! By the time it gets dark much of the stored heat in the garden has already been lost. If you have time, build a simple frame around the plant, or row of plants. (Even a single stake can be used in many cases.) Then drape a cover of newspaper, cardboard, plastic tarps, bed sheeting or any other lightweight material over the frame to create a tent. If you don't have time to create a frame, lay the protective cover directly onto the plant. This will help to slow the loss of heat rising from the foliage and the ground. Remove the covers in the morning, once the frost has thawed, to let the light and fresh air back in, and to prevent overheating by the sun. For smaller individual plants you can use glass jars, milk jugs with the bottom removed, paper cups upside down flower pots as heat traps. Don't forget to remove these covers in the morning. Container grown plants are particularly susceptible to frosts because their roots are also unprotected. If you are unable to move your container plants indoors or under cover remember to also wrap the pot in burlap or bubble wrap, or simply bury the pot in soil in addition to protecting the foliage. If your efforts were too late, or too little to protect your plants from a frost, resist the urge to cut off the damaged parts of the plants. To a certain extent, these dead leaves and stems will provide limited insulation from further frost damage. You will have to go back and re-prune your plants in spring anyway.